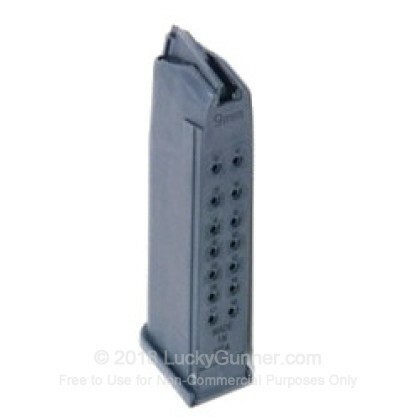 From ProMag comes a budget-conscience Glock 17 magazine. This 17 round magazine is made right here in the US of A and is constructed of DuPont Zytel high impact polymer. The rigid steel insert in the feed lips helps ensure good reliable feeding for years to come. The feed spring is also constructed from a chrome silicone wire for added reliability and corrosion resistance. This magazine will work with all generations of Glock 17, Glock 19 and Glock 26 firearms. Backed by ProMag's lifetime warranty against all manufacturer defects. These were priced great. Best deal I could find and They work great. They are all polymer with no metal lining but seem to be good quality. I've taken them to the range a few times with no issues. I would recommend these they are nice and you don't have to spend almost twice as much for a factory original. Several friends and myself ran a few hundred rounds of Remington UMC through these, and suffered no stoppages. 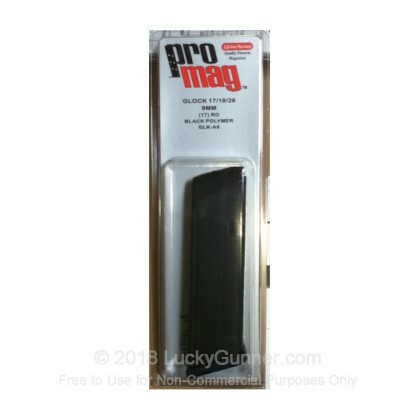 I personally have never had any issues with ProMag, and they're nicely priced. I've got a Glock 26, 9mm Compact that is a blast to shoot and is in my car at all times. I take it to the range often but get frustrated having to keep feeding the mags. These fit perfectly and give me the extra fire power I want at the range. Good price too. If you are a round counter, on round 16 you change mag's anyone within hearing range wont be able to know what size clip you have ! that is how easy the mag's go in and out. No loading misses in 7 full clips.